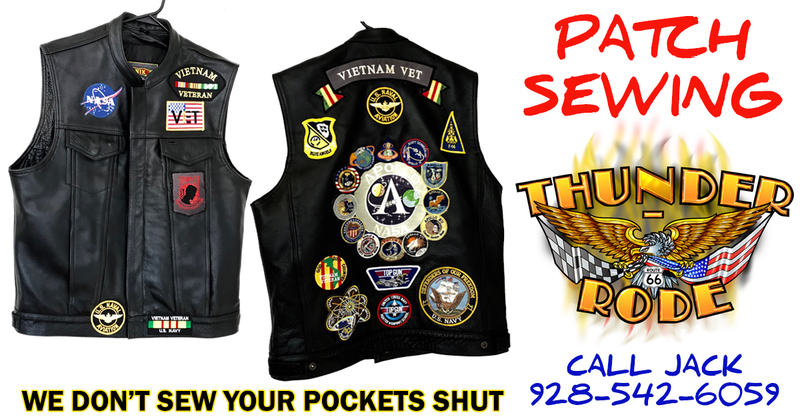 Thunder-Rode Motorcycle Accessories offers several different services to Kingman, AZ and the surrounding cities in Mohave County. We provide leather restoration services, leather repair services, custom leather item creation, sewing of broken nylon straps, and patch sewing. Please, read a short description of each sewing and repair service below. 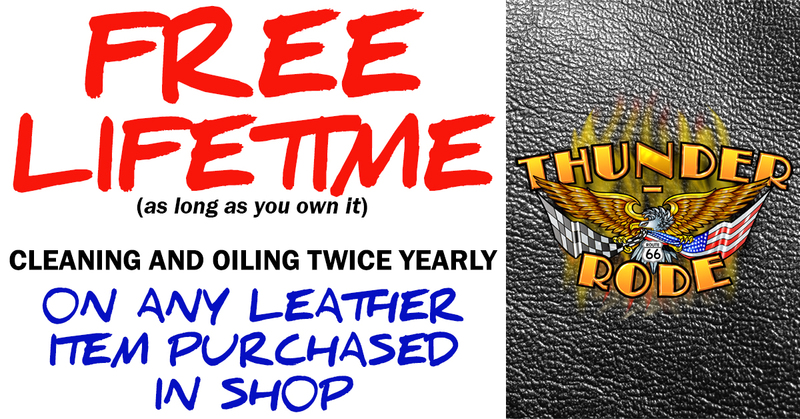 Thunder-Rode Motorcycle Accessories can bring the life back into your worn out leather goods. 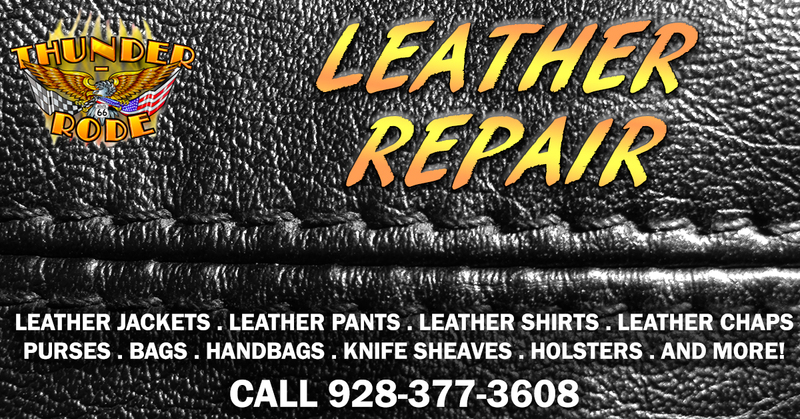 If you have a faded or cracked leather item (leather jacket, leather pants, leather chaps, leather vest), contact us today for reconditioning. We also offer free oiling and cleaning twice yearly (as long as you own it) of all leather goods purchased in our shop. Do you need something custom-made of leather? We do that, too! No project is too big or too small. Well, maybe... but give us the lowdown on what you want and we will let you know if it's possible. We make custom leather knife sheaths, bags, and more. We even made a custom leather gauntlet for a pro-dart customer. Contact us today and let us make your leather vision a reality. If your trusty backpack that you have bonded with over the years is falling apart at the straps, bring it in. We have fixed many travel bags, backpacks, overnight bags, etc. where the straps had broken. When you hate to see it go, bring it to us. We can probably fix it. 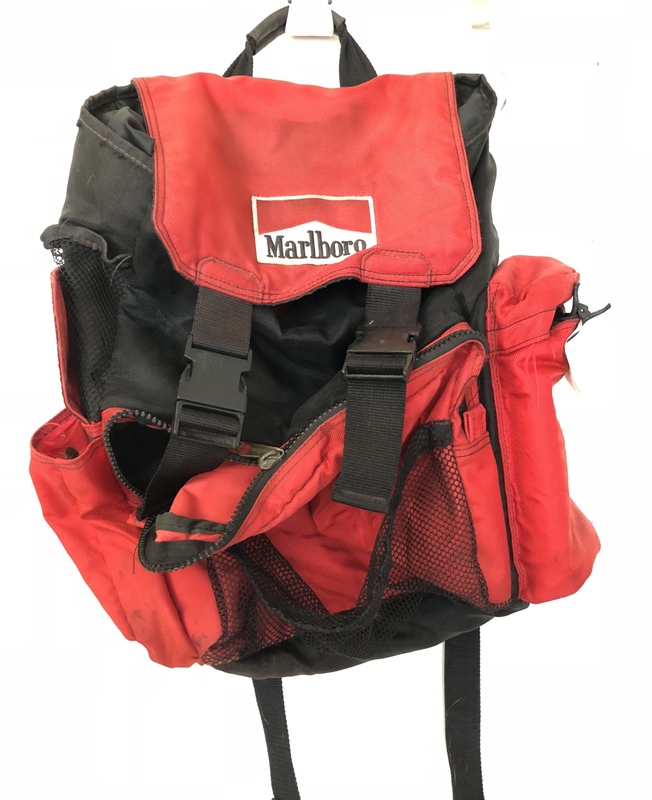 We recently fixed the straps on an old Marlboro bag a customer still had. We sew patches on! You can purchase one of our patches or bring in your own. Either way, we can sew them on your leather. We will not sew your patches shut! Our Singer 29K long-arm patcher enables us to sew all the way up to the shoulder and inside sleeves and pockets so you don't end up with unusable pockets and can have your patch sewn anywhere you'd like. Get our Patch Card and save on patch sewing. Our Patch Card is great for clubs with ongoing multiple patch jobs. We sew club patches from Phoenix to Vegas. Read more about patch sewing and custom embroidered patches here.